Okay...I got another big haul. (Not nearly as big as the serious coupon ladies, but not bad.) 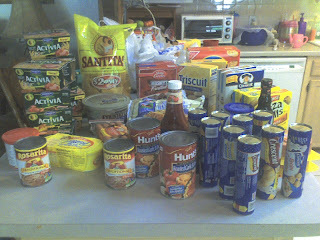 Albertsons was doing their price point sale with an extra $5 off every 10 items on the sale. Unfortunately I didn't count correctly and ended up 2 items short for the fifth $5 off. But I spent $42 and saved $107!